1799-1800. Invasion Noord-Holland and Linie van Beverwijk. We have the gunpowder filling room decorated with pictures, photographs, engravings on a violent time in North Holland. After reinforcements with Russian troops were deployed, continuation of the attack went on further Schoorl and Bergen. There were several battles with the French-Batavian army under the command of the French General and Chef Brune and LTN. generals Daendels Dumonceau and Vandamme in and around Bergen, the Zijpe, in the dunes and on the beach around and near Castricum. Both parties had 80,000 men in the battle. There were at least 20,000 casualties. However, surprisingly few civilians here. There was a lot of damage to household goods and livestock. Much was plundered by the soldiers. In one of the attacks on Bergen, the Russian General Hermann was surrounded and captured. Hoorn was conquered by the English leave without much damage to the city. Also Lemmer in Friesland was shot from the Zuiderzee and captured by the English. The Batavians French had withdrawn their command posts south to Purmerend and Beverwijk. The area around Purmerend, Edam, Monnickendam to Knollendam in the west was inundated. The Defence Line of North Holland was a waterline. Inundations and batteries (ground reinforcements) were commissioned by Ltn.Kol. Krayenhoff, Commander of the Batavian Engineers. It was the Defence Line of North Holland. A true waterline. Until October there was heavy fighting. The Battle of Castricum proved decisive. 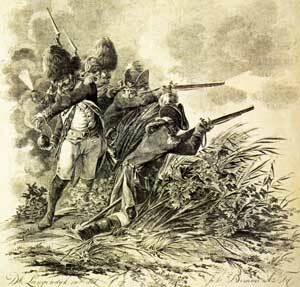 A treaty was announced on 18 October 1799 and it allowed the English-Russian coalition troops to withdraw. Directly after the fighting Daendels gave the assignment to Krayenhoff to strengthen Holland at its narrowest exit by reinforcements. Krayenhoff designed the Line of Beverwijk. A defense of fortifications (Lunetten) between Beverwijk and the coast at Wijk aan Zee. In the following years Amsterdam was surrounded by fortifications batteries. The Posts of Krayenhoff. Named after its designer. This is considered the forerunner of the Defence Line of Amsterdam. In the gunpowder room of the fort a model of a Beverwijkse Lunet is displayed. What is left of the lunettes over after 210 years? Discover in this exhibition at the fort and find it later on in the vicinity of Beverwijk and Wijk aan Zee. There is more than you think.